Sports are a great activity that pits individuals and teams against one another for the value of competition. Being able to fall back on your primitive drives and needs to be the best is enjoyable for all involved, from the players to the fans. One common issue that is inherent in sports is the inevitable injury. While our bodies are built to be tough, the fast and physical nature of many sporting events make sports injuries a normal event. Diagnostic medical imaging is an ideal service for finding the source of a health problem, and these imaging services can be ideal for diagnosing and treat any sports injuries sustained. North Pittsburgh Imaging Specialists is your go-to team for affordable imaging specialties, providing a wide range of services to meet our patients’ needs across Pennsylvania. 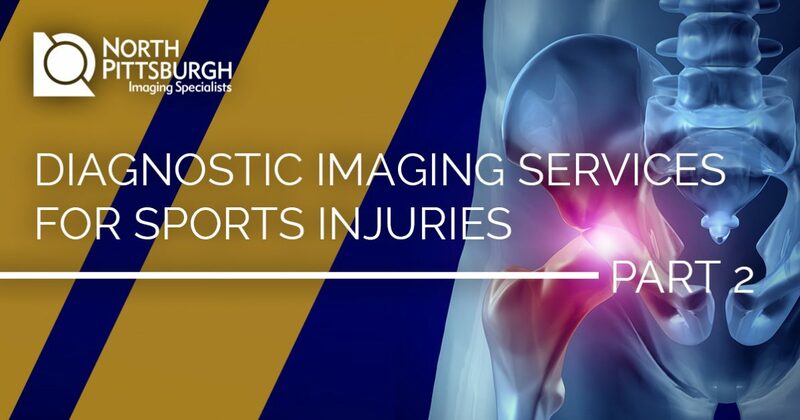 Today, our Pittsburgh imaging service specialists will continue to look into sports injuries and the value of radiology. If you are in need of diagnostic imaging assistance, be sure to contact us today for an appointment! Dislocations and tears. While your tendons and ligaments are crucial for many purposes, keeping joints in good shape definitely ranks among their top jobs. Unfortunately, joint damages are common in sports, where a weird fall or unlucky collision can result in serious injury. Concussions. One injury that has made major headlines over the past decade is the concussion. These brain injuries are still relatively mysterious, but the causes and symptoms are very clear. When you are jarred, hit, or make any sudden movements, the accelerated force that is exerted on the brain independently from the body can create a major impact on the inside of the skull. High medical attention is required with a concussion to minimize the damages and prevent future problems. As a radiologist, it’s essential to make a clear diagnosis of the extent of the damages done during a concussion. The imaging services provided after a sports injury will depend heavily on the type of injury sustained. Affordable imaging can be hard to find, especially with insurance companies that have stringent coverage standards. Generally, your doctor or sports trainer will begin with a simple x-ray to get a cursory glance at the injury in question. These services are ideal for simple results, including joint locations, fractures, and bone tearing. While not helpful for illuminating the connective tissues in your body, x-rays are a great place to start. Our medical imaging experts are here to help you with a variety of unique needs. Next time, we’ll continue on this subject by discussing the other types of imaging available at our disposal for your sports injuries. North Pittsburgh Imaging Specialists strives to be your provider of Top Rated Local® imaging, delivering quality results without the high price tag. We are proud to provide Pittsburgh’s imaging services, delivering accurate results with the goal of helping you thrive. Contact us today to learn more or to set an appointment for your medical imaging.